This post isn’t necessarily conlang related (but we’re going to make it so). First, my son found Cthulhu in a book of monsters quite some time ago and decided that was what he wanted to be for Hallowe’en this year. At the right is the result of our collaboration. He didn’t think anyone would know who he was…but we did have two teenage trick-or-treaters say “Run away from Cthulhu!” tonight. The slides can be viewed full-screen by clicking in the lower right corner of the slideshow after it starts. In keeping with the conlang focus of this blog, let’s construct a sentence. 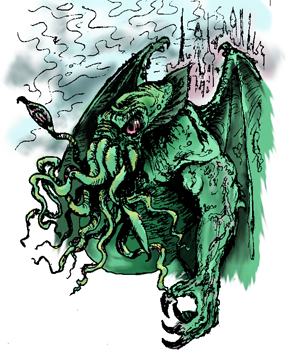 Referring back to my theory on R’lyehese: Cthulhu wgah’nagl! or “Cthulhu in his abode”.